Globe Birthday Cake, a photo by CAKE Amsterdam - Cakes by ZOBOT on Flickr. This one... a birthday cake for CJ from Las Vegas, coming Amsterdam to celebrate his birthday in Amsterdam with a friend from St. Petersburg. 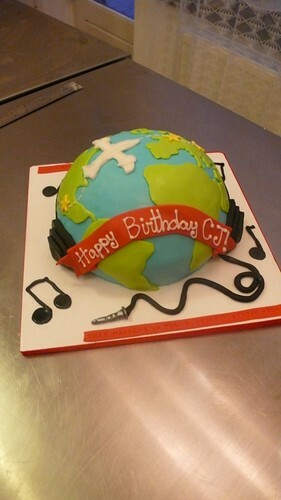 The globe had headphones on, since not only was CJ a pilot, hence the plane, but also a DJ!!! TEXT : "What Happens in Vegas Doesn't Stay in Vegas!" FLAVOR : Chocolate Cake with Vanilla buttercream and fresh strawberries and jam.